We seem to like naming things after people; buildings, streets, awards, etc. Everywhere you look there are names on the landscape, meant to memorialize some historic figure deemed worthy. But it rarely works. Generations pass, and we no longer apprehend the significance of the fact that we live on Adams Street or walk past DeWaters Hall on our trip through campus. That’s just what they’re called; it doesn’t even occur to us that they share names with specific human beings. When James Doty platted the first streets of Madison, Wisconsin, in 1836, he named them after the signers of the U.S. Constitution. Today, though, that connection is lost on many of its residents. They have no idea whom their street was meant to honor, nor know that all the street names share this common theme. 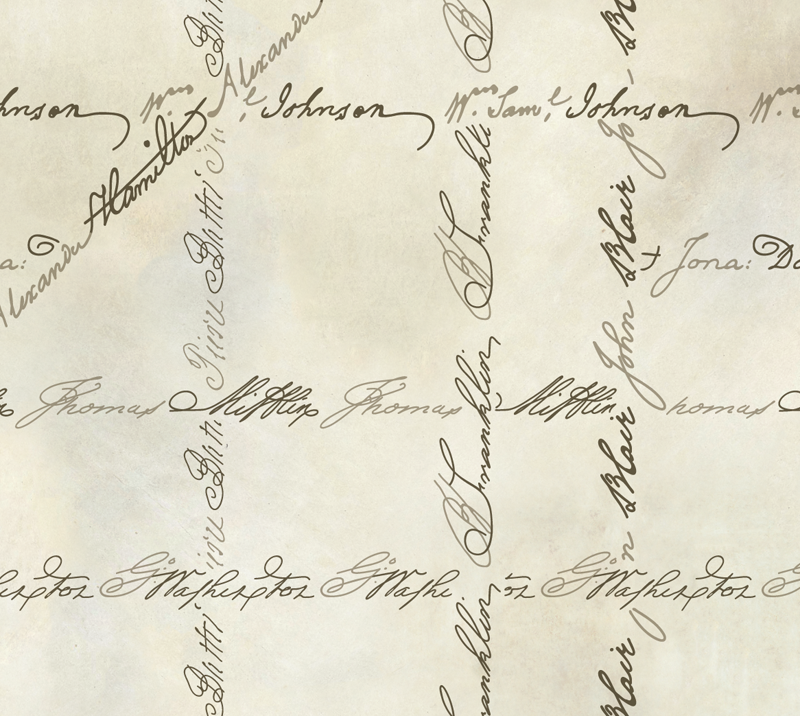 This last month I’ve been working on a map, The Ways of the Framers, which aims to reconnect Madison’s modern citizens with the people their city was intended to memorialize. 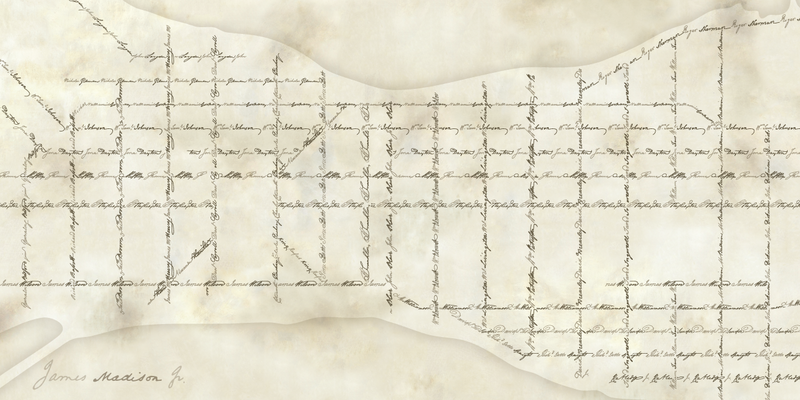 The street grid is rendered using signatures traced off of a scan of the U.S. Constitution. 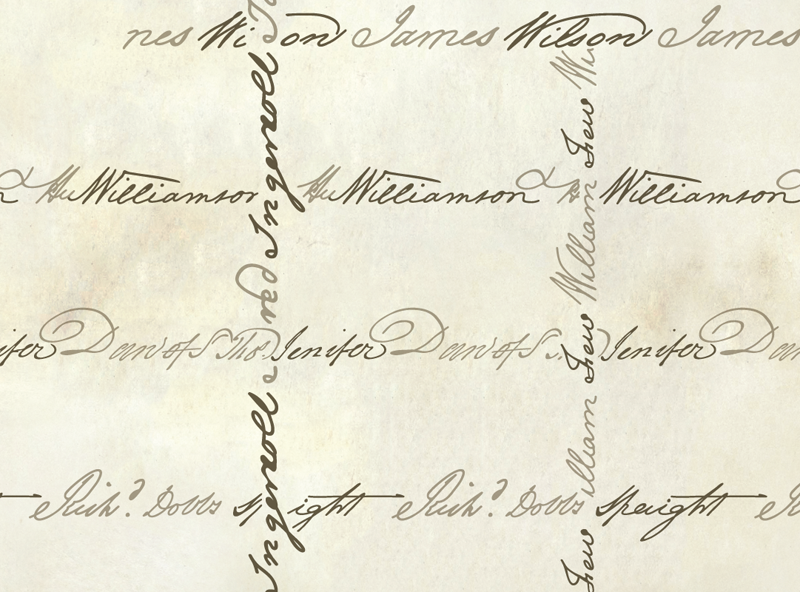 Handwriting is personal, and it putting it on the map is a way to give the reader a more direct human connection with the historical figure. It’s different than simply reading a webpage about each figure. It puts a little bit of George Washington’s personality into the landscape, into the place where the reader lives. Only the streets which are named after the Framers of the Constitution are shown, so it’s probably not the best map to use for navigational purposes. I almost included other streets on the map, such as those named after non-Framers, but ultimately decided to keep it focused and simple. Fun fact: Three of the framers no longer have streets named for them. Robert Morris, Gouverneur Morris, and George Clymer. Morris St. was later renamed to Main St., and Clymer St. was renamed Doty St.
Click on the thumbnails for a few images of the map. Click here to purchase a 36″ x 18″ print. Click to download a free PDF (~25MB), which you may use according to the Creative Commons Attribution-NonCommercial-ShareAlike 3.0 Unported License. If you wish, you can pay me what you think my work is worth: click here to donate via PayPal. Important: Zazzle will let you shrink the map down from the original size if you ask, but I cannot guarantee it will look good if you do. 10% of profits from the sale of prints of this map will be given to the University of Wisconsin Cartography Lab, which trains students in the cartographic arts. I was one such student, and I would not be where I am today without their support. It is a small way to repay the vast debt I owe them and help give other students similar opportunities. Note: This version of the map does not include streets that are not named for signers of the constitution. I have an alternate version, where those streets are shown with thin lines. Contact me if you would like to obtain a print or a PDF of this version.